Something about Fall has us all about seafood. 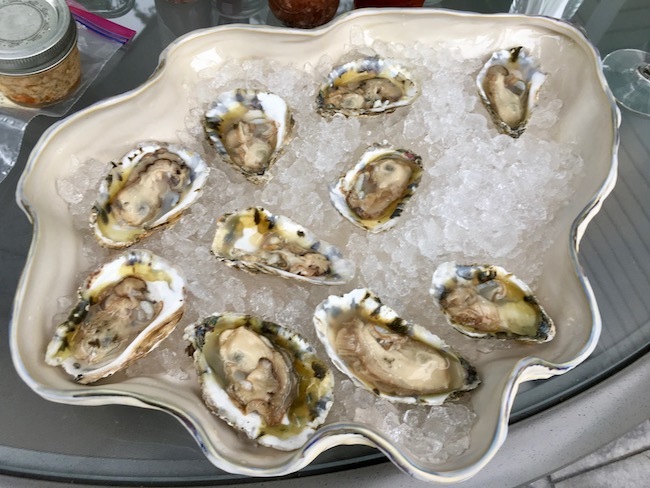 We love the transition from Summer’s hamburgers and hot dogs on the grill to this weekend when we roasted Oysters on the grill at a family birthday celebration. Now I can’t wait for my favorite fall festival, the Urbanna Oyster Festival. My sister made 4 glorious dipping sauces, 2 hot, 2 cold, as well as offering the traditional bottle of horseradish and Tabasco. The overwhelming favorite was this Sriracha Lime Butter which we think would also taste great on mussels, shrimp, crab and other seafood too. This week we are excited for the return of one of our most popular dishes, Shrimp and Butternut Squash Risotto, to the menu alongside some of our other delicious fall comfort food menus. Check out what’s cooking at supportsuppers.com and let us help with dinner this week. Thank you for your Support.